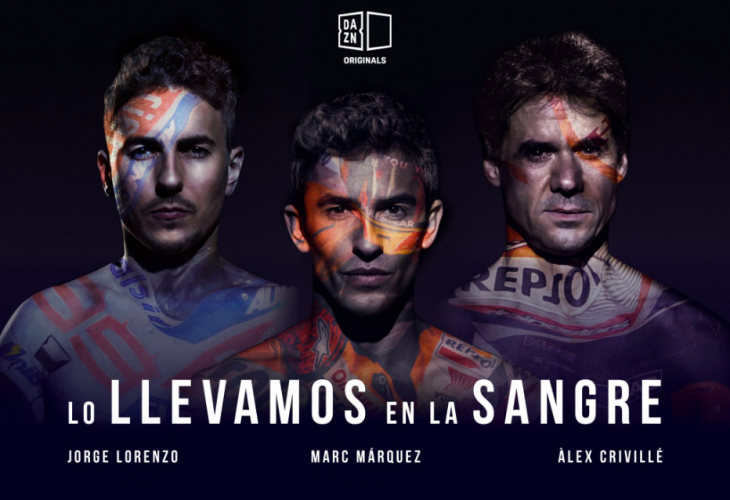 March 12, 2019 – DAZN, world’s first pure sport streaming services, has announced a three-part episodic original In Our Blood (Lo llevamos en la sangre), in association with Dorna, that celebrates the tradition of great Spanish MotoGP riders and marks the beginning of the new MotoGP season. Each episode will be screened on DAZN, DAZN Spain Facebook page, DAZN Spain YouTube channel, and terrestrial free-to-air channel TV3. Directed by Cannes Lion award winning director Pedro García-Mejía, the series explores Spain’s passion for MotoGP through the generations, by telling the stories of Spanish MotoGP World Champions Àlex Crivillé, Jorge Lorenzo and Marc Márquez. In Our Blood is the third original series produced by DAZN, following the documentary film Being Mario Götze and three-part follow documentary series Canelo vs. Rocky, as part of its burgeoning content strategy that combines original programming alongside premium live and on-demand sport streaming to take fans closer to the events and athletes that matter most. Episode 1, filmed in Seva Spain, brings Àlex Crivillé back to the Barcelona-Catalunya Circuit in Montmeló Spain where he became the 1999 MotoGP Championship and paved the way for future generations of aspiring Spanish champions. Episode 2, filmed at Jorge Lorenzo’s residence city Lugano Switzerland, gives viewers personal, unfiltered insights from him about his childhood and the 2010 season where he won the MotoGP Championship against his fellow Spaniard Marc Márquez. Episode 3, filmed at Marc Márquez’s bike shop in Cervera Spain, dives into his childhood, his family support and key moments in his career that made him a five-time MotoGP Champion at only the age of 25. In Our Blood is a DAZN Originals production in association with Minded Factory, a Spain-based creative production company, Line Producer Johanna Horn and executive producer David Barrera. For DAZN, the executive producer is Grant Best, SVP Original Programming and the producer is Simon Spender.